The intense international competition that our country faces in today’s global economy demands that all of America’s youth receive the kind of education that they need and deserve. Yet our public education system is failing us. In order to repair this broken system, the United States must confront the fact that inequality continues to plague our public schools. One of the most harmful manifestations of this is that local school district funding is allocated in a way that hurts poor and minority students. A study by the Thomas B. Fordham Institute found that educational funding is being allocated on the basis of "staff allocations, program-specific formulae, squeaky-wheel politics, property wealth, and any number of other factors that have little to do with the needs of students." The outcome of such practices is predictable: A further widening of the dangerous achievement gap that has become endemic in American schools today. Fortunately, smart federal policy can help to fix this situation. The four papers that make up this volume explore perhaps the most important component of this mismatch of U.S. educational resources—inequality in the funding of local schools by their own school districts. Nationwide, local school districts account for about 50 percent of all public school operating costs, which means these districts’ budgeting practices have a greater direct effect than state or federal education investments. Indirectly, however, existing federal legislation condones and has historically supported the way local school districts fund their schools. Federal education funding requirements, in short, exacerbate existing inequality in education at the local level. This happens because of language in Title I of the Elementary and Secondary Education Act of 1965, the so-called "comparability provision," which was supposed to promote equality of education but indeed does not. Its basic notion is that state and local funds for schools should be equitable before federal Title I funds are added to schools with large concentrations of low-income students. The comparability provision, however, also contains what some of us call a "loophole" that allows longstanding ways that local funds have been inequitably distributed to continue. Specifically, districts have historically allocated funds to their schools not by giving a dollar amount to each school, but instead by allocating "staff" resources to schools. As Marguerite Roza points out in this volume, "Most teaching positions and other staff full time equivalents, or FTEs, are assigned on the basis of enrollments. The formula might, for example, call for a teacher for every 25 students. The problem arises when staff FTEs are translated to real dollars." The difference in actual school expenditures are often substantial because teachers’ salaries are based on their experience and credits or degrees earned, and because high-poverty schools have many more less experienced, lower paid teachers and much more turnover than low-poverty schools. Roza found in her research in Baltimore "that when teachers at one school in a high-poverty neighborhood were paid an average of $37,618, at another school in the same district, the average teacher’s salary was $57,000." Assuming the same number of teachers in each school—say 20—the difference in dollars available for the two schools is $387,640. If a more sensible Title I comparability provision were enacted, then there is little doubt that local school districts would have to change the way they allocate and account for funding of their schools, which over time would ensure that a more fair and equitable local educational funding process would take hold across the country. This would be a major step in repairing the broken system of American school finance, and would reverberate through the hallways of American schools as disadvantaged students gained the educational opportunities they need to compete in today’s global economy. For over 40 years, federal policymakers and education advocates alike celebrated the Elementary and Secondary Education Act of 1965, especially Title I, which together with Title VI of the Civil Rights Act of 1964 heralded a major new role of the federal government—to guarantee equal education opportunity nationwide. And for a while there was reason to celebrate as the federal government and new federal education statutes empowered educational leaders to see to it that more and more disadvantaged American kids received the equal education they deserved. The guarantee to an equal education has never been fully realized—even though the federal government has never wavered in its promotion of equal opportunity in education.Unfortunately, this guarantee to an equal education has never been fully realized—even though the federal government has never wavered in its promotion of equal opportunity in education. As many analysts have documented, despite the federal help for schools with large concentrations of poor students, schools and districts with many low-income students continue to receive less than their fair share of funding—based on student need—up and down the nation’s highly decentralized system of public education. The federal government does distribute Title I money based on poverty, but it does so through a formula that combines numbers of children in poverty with state per-student expenditures. This practice penalizes states with low-tax bases even if they tax themselves relatively heavily for education. Many states have developed fairer state funding systems, often as a result of years of litigation in state courts. But as the papers in this volume make clear, there has been little change in the inequitable way that local school districts fund their schools. Almost all large school districts (sometimes unknowingly) expend more dollars on personnel and services in schools with fewer low-income students. Given the 50 percent local share of public school funding, this so-called "within-district" inequality has tragic consequences, as documented by the usually lower performance of students in schools with many poor students. This has not changed even after a new, standards-based framework for public education took hold nationwide in the mid-1990s. This new approach to public education called for high learning expectations for all students. It was subsequently made real by the adoption of accountability systems through state legislation and the 1994 reauthorization of the Elementary and Secondary Education Act under a new name, the Improving America’s School Act, alongside the enactment of Goals 2000, which required state adoption of rigorous curriculum standards and new state tests to measure student performance against these standards. Then, in 2001, the next education reauthorization brought us the No Child Left Behind Act, which was signed into law by President Bush in 2002. NCLB enacted a tough performance standard, requiring that all students be proficient in math and reading by 2014. States were required to assess students annually in grades 3 to 8, and report on their performance by subgroup, including for students from low-income families. The presidential and congressional motivation behind the NCLB upgrade of the Elementary and Secondary Education Act was to put increased pressure on state and local education policymakers to focus on the educational needs and learning results of disadvantaged students—whether they came from low-income or minority group families, families whose first language was not English, or students with disabilities. The federal government substantially increased its support for high-poverty schools for a couple of years after the passage of the NCLB Act. But state and local policymakers never leveled the educational playing fields with their funds, and the federal government did not push them to do so. While the harm falls most heavily on low-income students, the unfairness to hard-working teachers, principals, and other staff in the schools of these students is almost as tragic. It is fundamentally unfair to hold educators accountable for reaching the uniform high standards of NCLB when the monetary tools with which they are provided are so unequal. But what’s encouraging for students, teachers, and administrators alike is that federal legislators can correct these inequities if they take the time to understand the complex issues at hand in their states and congressional districts and then act on some of the lessons already learned by select school districts now experimenting with new ways to budget education funds. In this volume, our four authors look at virtually all aspects of the federal and local "comparability" issue. While each is an advocate for major change, they don’t always agree in their analyses or on a preferred course of action. That’s neither surprising nor desirable given the diffuse magnitude of the problem. But what’s most encouraging is that the logic of their arguments point toward similar policy conclusions. The first paper, "The History of Educational Comparability in Title I of the Elementary and Secondary Education Act of 1965,"is by Phyllis McClure, an independent consultant and longtime student of ESEA Title I since its passage, and a consistent advocate for improvements to Title I. McClure traces the history of the debate around the enactment of Title I in 1965, and the problems with its early implementation, which led Congress in 1970 to add the comparability provision as well as other provisions to tighten up how Title I educational funds were spent. McClure then discusses the initial federal efforts to enforce the comparability provision in the 1970s and 1980s, followed by 20 years of lax enforcement, and then more recent renewed attention to enforcement. She concludes by describing the current context of school funding and its relation to the comparability provision, and then making recommendations for securing the fiscal integrity of Title I funds. The second paper, "Strengthening Comparability: Advancing Equity in Public Education," is by Ross Wiener, vice president for program and policy of the Education Trust. In his paper, Wiener discusses the importance and shortcomings of the comparability provision. He describes in detail how the weak comparability provisions of Title I allow funding gaps to persist, providing several examples from local school districts. Wiener then explains why this is so harmful, turning next to discuss the important and positive changes to the comparability provisions that were included in the "discussion draft" of the No Child Left Behind Act reauthorization proposal issued by the Chairman of the House Committee on Education and Labor, Rep. George Miller (D-CA), and the Ranking Member of the Committee. Rep. Howard P. McKeon (R-CA) in the summer of 2007. Wiener concludes with recommendations for strengthening the comparability provision. The third paper, "What If We Closed the Title I Comparability Loophole?" is by Marguerite Roza, research associate professor at the Center on Reinventing Public Education, University of Washington. Her paper explores why the current comparability provision falls so short of what is needed, and the reasons for modifying it. She discusses why federal leadership is important, and outlines budgeting and funding considerations that need to be taken into account in making a change. 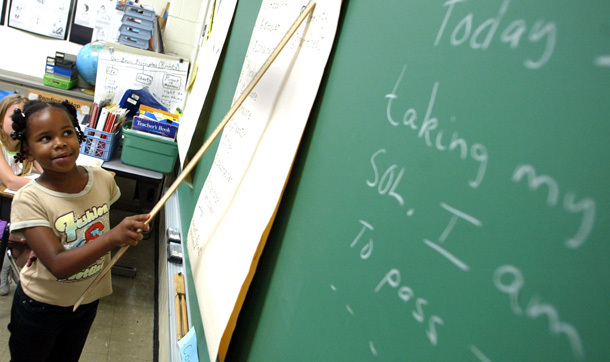 Roza then explores the likely effects of these proposed changes on high-poverty schools. In the end, she suggests that the best way to restore the comparability guidelines of Title I to their original intent is by requiring school districts to equalize per-pupil dollar expenditures before accepting federal funds. In this way, the federal government can be proactive without micromanaging the budgeting processes of myriad local school districts. The final paper, "Funding Schools Equitably: Results Based Budgeting at Oakland Unified School District," is by Matt Hill, executive officer of strategic projects for the Oakland Unified School District in Oakland, California. Hill examines why "Oakland Unified" decided to change the way it funded each of its individual schools, how the sprawling school district managed the process, and the relevance of the experience to the reform of Title I comparability provisions. Hill provides a thorough overview of the Oakland school district’s history and budget reform strategy, and then delves into a detailed explanation of Oakland Unified’s so-called "Results-Based Budgeting," and how this process differs from other equitable funding allocation models used around the country and in Canada. He then discusses the implementation of Results-Based Budgeting, and then the results, the challenges, and the lessons learned along the way. Hill concludes with recommendations for federal and state authorities to consider when they map out policies to help local school districts address the inequities caused by traditional funding models. And his conclusions are important because Oakland Unified is the only local school district in the country to fully implement equitable funding of all of its schools on a per-school, per-pupil basis..
Hill and the other three authors arrive at some uniform conclusions about ineffective and inequitable educational spending by the federal government on Title I schools. More importantly, each one in a different fashion points the way toward solutions to a complex budgeting issue that is a root funding cause of our ill-performing public schools. Together, these four papers make an invaluable contribution to the debate over how to fix our public school system. They point the way for the next administration and the next Congress to fix federal funding for Title I schools. For the future of all American children and our country, these changes can’t come a moment too soon.